Well our latest flood defences are almost complete and they will hopefully do the trick and hold back the next deluge that comes our way. Firstly we added a further 10 tons of gravel to the end of our car park, thereby raising it by almost a foot. Our plan was that by raising that area it would reroute any water that made it onto the carpark, to help it finds its way into another ditch alongside the lane, therefore keeping it away from the teashop. Secondly we have dug a new ditch from the centre of a field out into a main dyke, so that water levels in the fields don’t build up to the extent that they have previously, ultimately adding to the problems that we have experienced. Why is it that you always get your best photo opportunities when you don’t have your camera with you or your hands are full. I was walking up the green mile the other morning when not one, but 6 Red Kites flew over head. Round and around in circles they flew, it was a beautiful site and they were so low to the ground, I can only imagine the pictures I could have taken, if only that camera had been around my neck. I have discovered over recent weeks that we have a very efficient animal feeding aid on the farm, one which alerts me when the feed has run low and needs topping up. Now I know the sheep are keen to help and will always make out that they are hungry if I go near them, but it’s not them. It’s not the pigs because they’re just good at telling the time or they know instinctively when mealtimes are and like to let me know that they know. 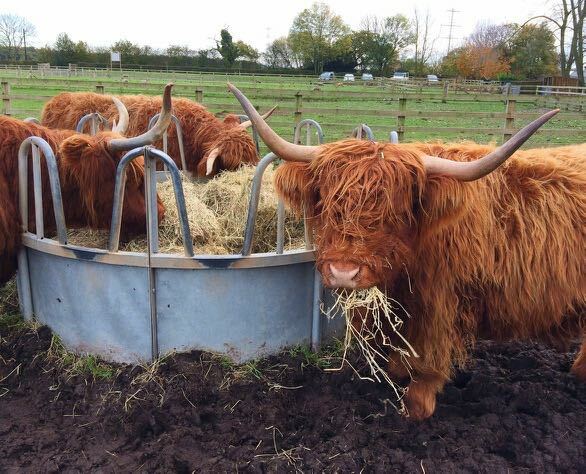 Over the last few weeks I’ve been doing some tests and the results show that immediately after that last stalk of hay has disappeared out of the cattle feeder, Flora the Highland, will let us know that it needs filling up. It doesn’t matter how far away I am on the farm, inside or outside, I can hear her calling, I just hope that alongside Lyndsey, she’s eating so much because she’s eating for two! It seems that all those rigorous checks I undertook to establish that we were buying a lovely placid Tup at the recent sales, may not have been as thorough as they should have been. It was once again feeding time and I had trekked up to the top field with some food for Mac and his ladies. I walked through the gate and gave a few of the sheep a cuddle, as I do, when they came running over and then continued to fill the feeder with their food. That’s when out of nowhere, when my back was turned and I was looking the other way, I felt a thud into the side of my right thigh, as though I had been hit by an Austin allegro . The force of the impact sent me flying sideways but luckily I had a row of sheep tight up against me which ensured I didn’t go headlong into the dirt. I immediately turned in the direction of this impact, instinctively knowing even before looking that I had just experienced my first whack from Mac! He looked up at me with innocence in his eyes, like some kind of fluffy brown angel as though to say “What, me!”, but I knew the truth. You can be sure I won’t be letting that rum’n get a run at me again.